People often say you aren’t a ‘true’ New Yorker until you have seen at least one Broadway show, have become a Yankees or Mets fan and stored at least a dozen crisp bagels in your freezer for a rainy day. New York is the only place that gives you easy access to the best tasting cultured food in the planet. It’s one of the only places to live that gives you easy access to buy Caribbean-Spanish food for breakfast, Turkish food for lunch, authentic Italian cuisine for dinner and Jewish chocolate rugelach for dessert. Living in New York is why everyone should live in New York. If you are moving from Boston to New York, you will need access to professional New York movers to help make your move an easy transition and stress-free. Lexel Moving provides affordable weekly long-distance moves and we specialize in both residential moving and commercial moving services. In addition, our licensed and trained packers provide professional packing services. Our free moving box service will deliver your boxes to your home or office on the day of your move. Thanks to our Boston movers, moving your belongings to New York will be one less thing to worry about on moving day. Unless you plan on driving, the first thing you will want to do is purchase a MetroCard. A MetroCard gives you access to the New York City subways. MetroCards can be purchased from MTA vending machines, sales booths or any MTA Metro-North Railroad station. You can save time, and avoid long lines, by refilling your MetroCard through EasyPay. If you plan to live in the suburbs, and work in the city, Long Island Railroad tickets can be purchased at LIRR vending machines at every railroad station (or Mail & Ride). You can buy tickets on the train, but it is more expensive. Traveling peak hours is also more expensive – off-peak is cheap. Consider Park & Ride if you plan to drive and commute by train. If you will be traveling to New Jersey, Philadelphia, Northeast PA (Poconos/Scranton/Wilkes Barre) or the Casino, Martz Trailways is a convenient mode of transportation. Martz buses have free Wi-Fi and the rates are reasonably priced. Take advantage of their specials, commuter discounts and casino fares. There are also $15 passenger vans that commute from NYC to Stroudsburg, PA and Hazleton, PA daily. Manhattan isn’t the only place to find a job or open a business. Long Island is a great place to work and do business. Jericho, Mineola, Westbury, Melville, Hauppauge and Bohemia, NY are considered major business hubs. If you are an entrepreneur and you have your heart set on staying in the city, you will be pleased to know that NYC has a few affordable, trendy shared office spaces and co-working spaces to choose from. If you’re always on the go, there are even rent-free workspaces. By the way, Central Park and other major NYC parks have free Wi-Fi. If you’re an Apple user, you can visit the 24-hour Apple Store to get your iPhone, iPad or other Apple products repaired. If you are moving from Boston to New York City, don’t neglect the other areas of New York that are beyond the city boundary. There are so many things to do in New York City that you can easily miss out on A LOT. For example, Long Island has a few nice beaches along the North Shore, South Shore, Fire Island and Hampton Bays. There are also several parks, such as Eisenhower Park, which is one of the closest parks to NYC, on Long Island. Don’t neglect Upstate New York. Upstate is north of NYC. Upstate NY is often treated like the unwanted stepchild because most people focus on New York City and Long Island. Albany, the capital of New York, is a great place to visit. However, it is more rural compared to Long Island. Albany is about 3 hours away from NYC. Upstate New York has several towns, such as Rochester, Buffalo, Syracuse, etc. A lot of New Yorkers, who live in the city, love to travel Upstate for weekend getaways. Some out-of-towners get Staten Island, Long Island City and Long Island mixed up. Long Island is a suburb of NYC (Nassau and Suffolk County). The Island is one of the longest and largest islands in the US (118 miles). Long Island City is in Queens and Staten Island is one of the 5 boroughs of NYC. If you live in Staten Island, you can take the ferry to get into Manhattan. Also, Manhattan pizza is good, but it isn’t known as the greatest pizza in the world. Brooklyn and Long Island dominate great authentic Italian Pizza. After you settle in, consider going on a food tour, in NYC, to familiarize yourself with the variety of foods the city has to offer. During the summer, New York City has free concerts in Central Park and Jones Beach. But, there is nothing more intriguing than the live street performers in Manhattan. Many people talk about the high cost of living in New York. But, you can get good deals, especially on clothes. You’ll find Haute Couture clothing on the Upper East Side along 5th Avenue. Then you’ll find a lot of department store brands all throughout the city. Soho and Chelsea are great places to get clothing deals. But, you are not a true New Yorker until you have purchased at least one or two articles of clothing from a street vendor. By the way, New York’s sales tax is 8.875%. Clothing or footwear that costs less than $110 is tax-free. Major events include New York Fashion Week, the Saint Patrick’s Day Parade, the Macy’s Thanksgiving Day Parade, the Tree Lighting Ceremony in Rockefeller Center and the annual September 11th memorial. If you have kids, don’t forget about the Bronx Zoo, the Planetarium, Coney Island, Rye Playland, Adventureland and a few other amusement parks. Niagara Falls is also a great place to visit with friends and family. If you love to run and you have dreamed about participating in the New York City marathon, you’ll more than likely be placed on a waiting list. In the meantime, there are many other notable marathons across the state to join. About 50 miles away from the city, there is a town called Huntington Village, known as Little New York. This town, located on the North Shore on Long Island, is coined as Margaritaville because people love to come from far, to the village, to eat and drink, especially on the weekends. During the day, it is a family-friendly town with a museum and a Cinema Arts Centre. Huntington also hosts the annual Tulip Festival in May, and the October Festival during the fall. New York has several big malls like the Manhattan Mall, The Shops at Columbus Circle and Brookfield Place. Long Island has a few malls including Roosevelt Field Mall, Green Acres Mall, Westfield Sunrise Mall, Walt Whitman Mall and the Smith Haven Mall. Then you have the Woodbury Common Premium Outlets, Tanger Outlets in Deer Park and in Riverhead. Then you have Waterloo Premium Outlets in Upstate New York. The first thing that comes to mind when people think about New York is the concrete jungle. Most people are unaware that there are 15 major beaches, not including the Hamptons and smaller beaches throughout Long Island. Keep in mind, if you are driving, some beaches charge for parking. If you want to dodge the fee, your best bet is to go to the beach after 6:00 pm. It will take a person a total of 8,361 days to eat at each restaurant in New York City – that’s approximately 22.9 years. Here are few good restaurants to start off with. Make Sandwich (the new sandwich child of Melt Shop), in Union Square, has great gourmet sandwiches. Their chicken and chorizo is to die for! Katz Deli on 205 E Houston St., on the Lower East Side, has the best sandwiches. Their Pastrami on rye with a Kosher pickle on the side is delicious. It’s a great family-friendly place to eat, but make sure you get there early to beat the crowd. If you’re planning to dine in, make sure you designate someone, from your party, to grab a table while you stand on line. Otherwise, you may not find seating together. Scoops on 624 Flatbush Ave., in Brooklyn specializes in the tastiest dairy-free ice-cream and vegan, Caribbean comfort food at reasonable prices. Scoops has limited space, so plan on placing your order to-go. Queens has great authentic Trinidadian style restaurants all throughout Liberty Avenue. Trini Delite on 110-02 Liberty Ave, South Ozone Park, NY is known for their West Indian vegetarian Roti, chicken Roti and beef Roti. Order two doubles with curried chickpeas (Channa peas) with Tamarind sauce and a wrapped Roti with the bread skins on the side if you are a newbie to West Indian food. The Bronx has Kai Fan Asian Cuisine & Sushi Bar on Riverdale Avenue. Red Apple Restaurant on Hyland Blvd and Incas Grill Peruvian Kitchen in Grant City, in Staten Island, are great restaurants to visit. If you’re planning to visit Robert Moses State Park Beach (Long Island) this summer, have lunch at Greek Garden restaurant (the last best restaurant before the beach exit), in Babylon Village, they have great Gyros. The Atlantis Diner is a great family-friendly restaurant, they serve Greek and Mediterranean and continental food. If you’re driving, take the scenic route back to NYC on Ocean Parkway – there’s no traffic – the drive alongside Captree State Park and Jones Beach State Park are breathtaking. You just have to know which grocery stores and food markets to shop. Whole Foods is not the only grocery store around. If you are a health nut, there are many small mom and pop grocery shops that sell organic foods. For example, Khasky Foods in Gravesend, Brooklyn, on Avenue U, sells affordable imported Kosher foods. There are fruit and vegetable stands on every corner, in Manhattan. So, you will not have a problem gaining access to affordable fresh fruits and vegetables. Harlem also has a few good organic fruits and vegetable markets. There are some markets in Manhattan that will even deliver fresh organic fruits and vegetables to your home or place of business. You’ll want to also try the Chinese food markets in Chinatown. Don’t neglect the bodegas, out of pride, they are convenient places to shop when you’re in a hurry. Sometimes bodegas sell ripe mangoes on the cheap. If you have a big family, and you’re budget conscious, consider stocking up on healthy eats outside of the 5 boroughs (Manhattan, Staten Island, The Bronx, Brooklyn and Queens) and shop at Costco in Farmingdale and Hauppauge, NY. You can get affordable organic foods at the Walmart Neighborhood Market in Levittown, NY – they’re open 24-hours. Secaucus, New Jersey also has a 24-hour Walmart close to NYC. 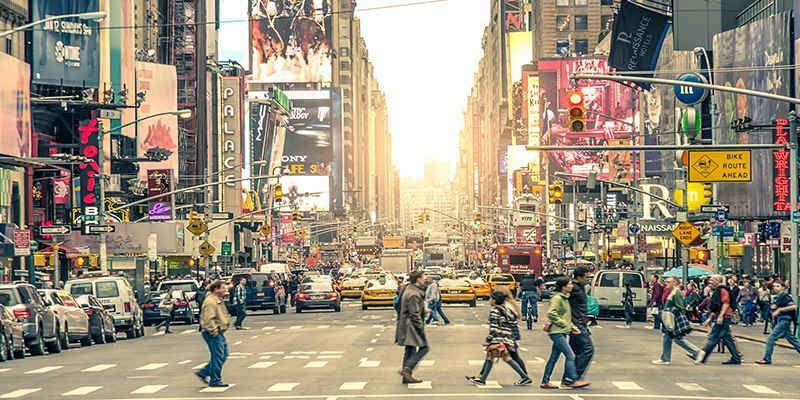 Hopefully, these tips have given you the essential things to know when moving to New York. For a quote on our New York movers and Boston movers, call 1 (855) 605-7755 or contact us online.